This morning Spirit and I took a Bait and Gait class as a warm up for the mock show this afternoon. 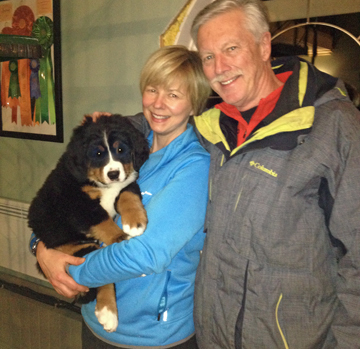 She did pretty well for a dog that loves to sit….a big no no for the show ring. Then this afternoon the handler took her and worked her in the mock show. Her brother Samson, her big brother Axel (same parents first litter) and the breeders’ Newfie Ryder were all in the same show. Axl made it to best in show but lost to a beautiful Golden. Spirit was so wiggly every time the judge touched her and when she tried to look at her bite. She made the cut for the female working dog group but ended up losing to a cute boxer. I think it was a great experience for her that hopefully will have her better prepared for the real show. 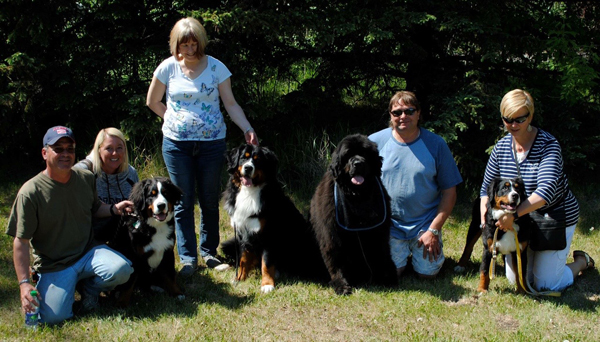 The handler Jo-ann said she did a good job so hopefully she will do her breeders/grandparents (Steve and Coreen Johnson of Tailspin Bernese Mountain Dogs) proud next week at the Northern Alberta Canine Association all breed show. This video is for you Coreen since you didn’t get the opportunity to see your grand-daughter “strut her stuff” in person. 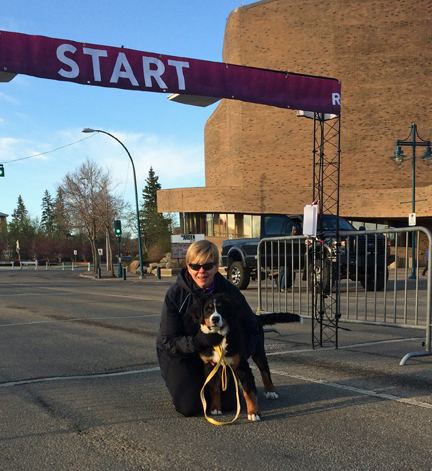 We all got up bright and early to head to St. Albert so that I could participate in the Run Wild Half Marathon. Spirit was a great cheerleader at the start line and attracted tons of attention. 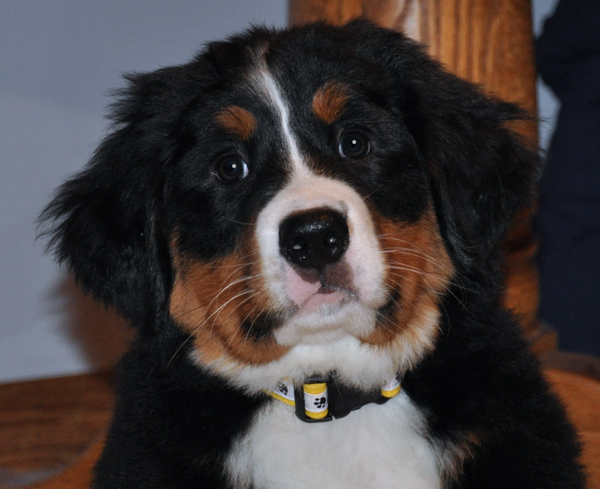 There is something about a Berner puppy. Everyone just wants to meet her and smooch her up. After the race we had to go to Spirit’s conformation class. 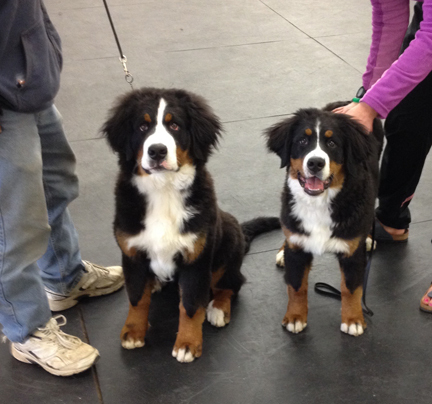 Her brother, handsome Samson, was in the same class so we finally got a picture of the two of them together. Although Spirit is about the same height as Samson she looks dwarfed beside him. He also weighs about 13lbs more than her (that’s about 20% heavier). 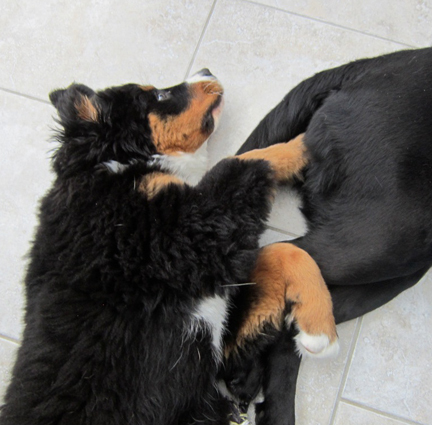 This afternoon I took Spirit back to the breeder (Tailspin Bernese Mountain Dogs) so that Coreen (Grandma) could see her. I could see that Spirit definitely remembered her and was curious to be back at her birth home. 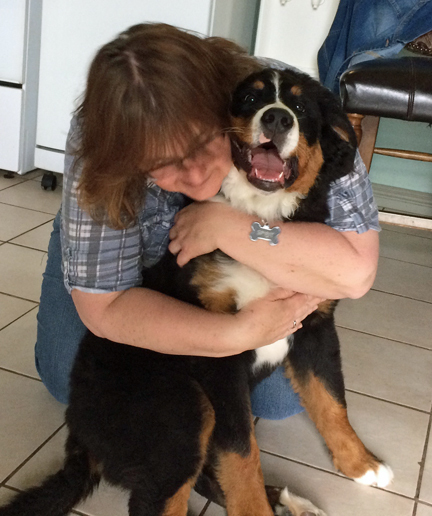 She was very excited to see her Mom Sophie again….unfortunately the feeling wasn’t mutual. 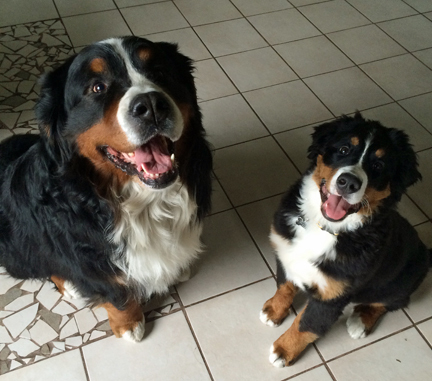 All was not lost because Jake, a beautiful 6 year old Berner, was quite nice and gentle with her. She looks dwarfed by his huge head and 110 pound body. Can you caption these photos? When I saw these pictures I couldn’t stop laughing. It looks like Spirit was trying to give Hope a clear message. 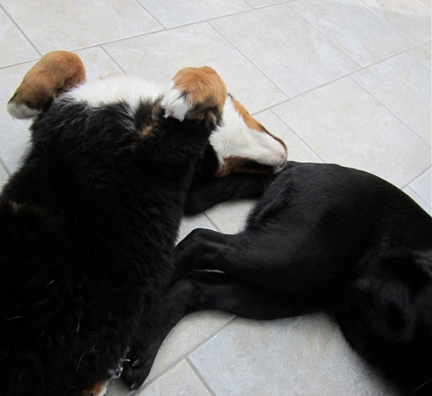 In the first picture she is sound asleep with her nose parked in Hope’s behind and in the second one her eyes are wide open and see appears to be pushing her paw against the area that is offending her. Last night the breeder called and asked us if we would like to pick up our puppy one day earlier. We have a snow storm coming on Thursday and she was worried about us making the hour long drive out to her farm in a blizzard. Very thoughtful and of course I would love to get Spirit as soon as possible. Well here she is. It was a very stressful ride home in the car. It looks like I am going to have my first puppy who is terrified of being in the car. We’ll work very slowly and hopefully get her more comfortable. We took just a few pictures when we got home and now she is crashed. Hopefully we will have a quiet night. Welcome to your new family Spirit.